China - Cuddle Up To Panda Bonds - Brief Analysis Of The Application And Issuance Of Panda Bonds From A PRC Law Perspective. On September 8, 2018, the People’s Bank of China (the “PBOC”) and the Ministry of Finance jointly promulgated the Interim Measures of the Administration of Offshore Institutions’ Bond Offering in National Interbank Bond Market (the “Interbank Panda Bond1 Measures”). 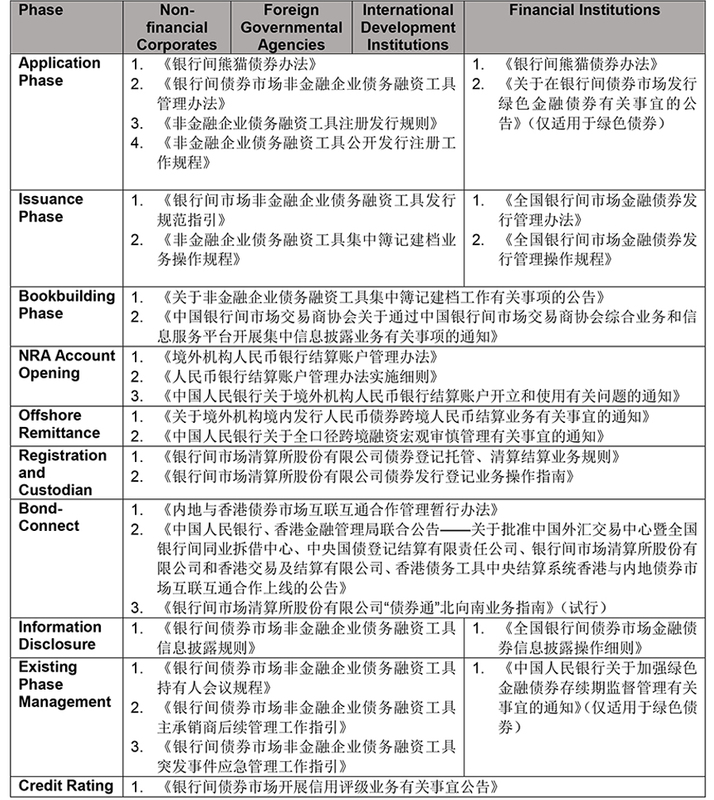 The Interbank Panda Bond Measures and the Notice on Launching the Pilot Program of the Belt and Road Bonds (the “Notice on Stock Exchange Panda Bonds”) promulgated by the Shanghai Stock Exchange and Shenzhen Stock Exchange (collectively, the “Stock Exchanges”) in March 2018 constitute the main legal sources for offshore institutions’ Panda Bond offerings on the interbank bond market and stock exchange bond market respectively. These two regulations together with the interbank bond market rules promulgated by the PBOC, the National Association of Financial Market Institutional Investors (“NAFMII”) and other stock exchange bond market rules promulgated by the China Securities Regulatory Commission (the “CSRC”) and stock exchanges form the preliminary legal framework for Panda Bonds. We understand that NAFMII is drafting the guidelines for the registration and issuance of bonds by foreign governmental agencies, international development agencies and non-financial corporations on the national interbank bond market. With the release of such guidelines, the legal supervision system of Panda Bonds will be more complete. Please refer to Appendix I for the detailed laws and regulations applying to Panda Bonds. Based on the latest legislation, and our previous experience on relevant projects, we have summarized the key procedures and issues when applying for Panda Bonds issuance in this article. Please click on the table to enlarge. Pursuant to the Notice on Stock Exchange Panda Bonds, national or regional governmental agencies, non-financial corporations and financial institutions within the “Belt and Road” region can apply to the Stock Exchange for the issuance of “Belt and Road” Panda Bonds. Currently, all Panda Bonds issuers in the stock exchange bond market are non-financial corporations; to date, no financial institution, governmental agency or international development institution has issued Panda Bonds on the stock exchange bond market. 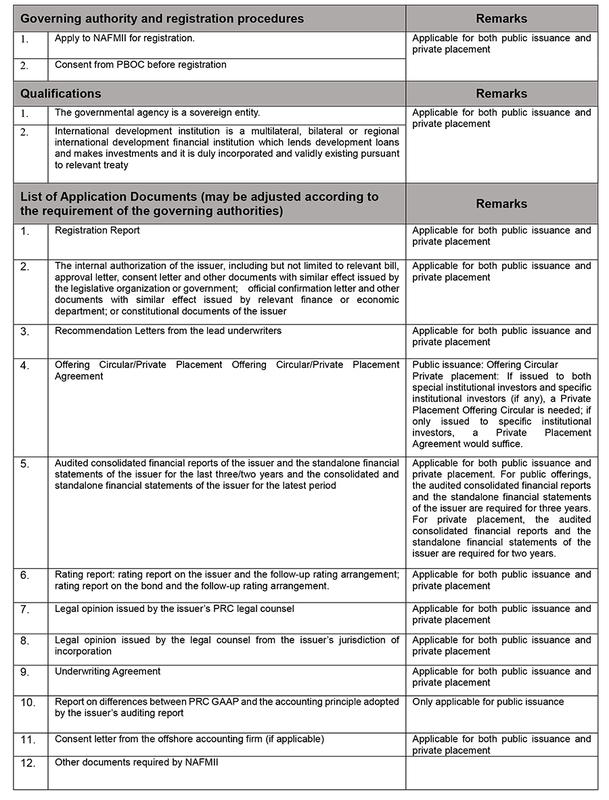 We understand that the following list applies to both non-financial corporations and to financial institutions. However, with the exception of the “Belt and Road” Panda Bonds, the qualification of issuers and substantive conditions of issuance for foreign governmental agency issuers and international development institution issuers remain to be further clarified by the Stock Exchange. Differences in the accounting principles adopted by Panda Bond issuers and CASBE have been a long-running obstacle deterring many potential Panda Bond issuers. 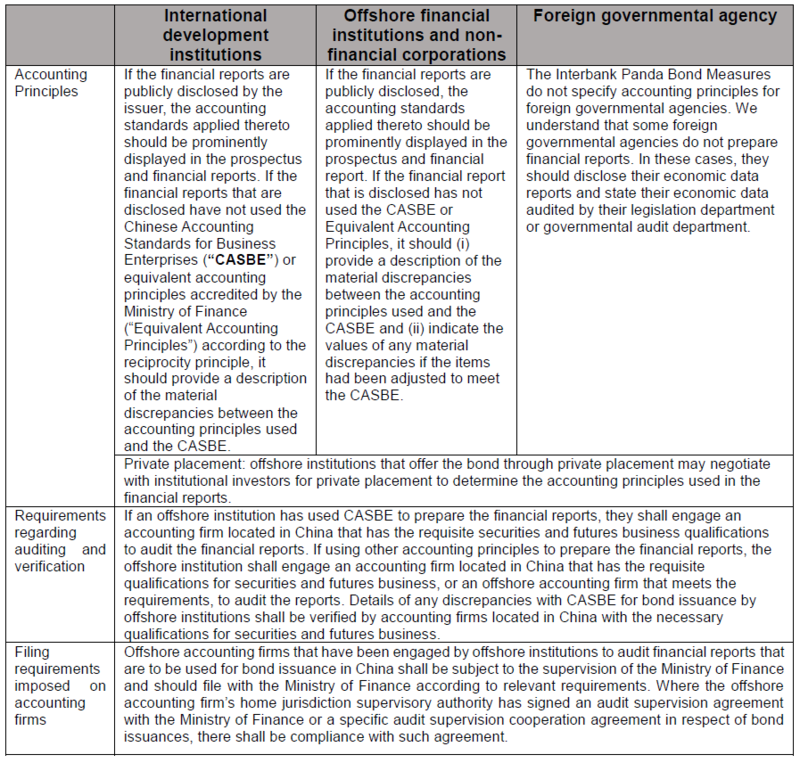 Prior to the promulgation of Interbank Panda Bond Measures, the only accounting principles that had been accredited by the Ministry of Finance as being equivalent to CASBE were the International Financial Reporting Standards adopted by EU listed companies for their consolidated financial reports, and the Hong Kong Accounting Standards for Business Enterprises. Since there are only a limited number of Panda Bond issuers using these equivalent account principles, many potential Panda Bond issuers put their issuance plans on hold. The Interbank Panda Bond Measures allow issuers using non-equivalent accounting principles to apply for public issuance if they provide relevant supplementary information; issuers who find it difficult to provide such supplementary information may choose private placement as an alternative. Only when the issuer and the investor are both non-PRC resident enterprises can bond interest be exempted from PRC enterprise income tax. For any income earned through the transfer of bonds, if the investor is a PRC resident enterprise, such investor is required to pay Chinese enterprise income tax. It should be noted that if the offshore investor is registered outside of China but has de facto management bodies in China, such investor will still be treated as a PRC resident enterprise and will thus be subject to Chinese enterprise income tax. Under PRC value-added tax law, an offshore investor’s transfer of Panda Bonds constitutes a financial product transfer service. If the transferee is located outside of China, the offshore investor’s income earned from such transfer is not subject to PRC value-added tax. If the transferee is located within China, the offshore investor’s income earned from such transfer is subject to PRC value-added tax. Certain offshore investors accredited by the PBOC may be exempt from such value-added tax. When issuing bonds, Panda Bond issuers should also consider the tax laws and regulations of their home country or jurisdiction. The Interbank Panda Bond Measures do not explicitly detail the applicable laws or dispute resolution mechanisms for Panda Bonds. Panda Bond issuers unfamiliar with PRC laws but with extensive experience offering bonds on international capital markets may assume that they can apply non-PRC regulations as the applicable laws and arbitration option should a dispute arise in the course of Panda Bond issuance. However, based on the current practice, even though the Interbank Panda Bond Measures do not explicitly detail the applicable laws or dispute resolution mechanisms, the competent authorities still require the transaction documents of Panda Bond issuance to be governed by PRC law and for the resolution of any dispute, including the litigation and arbitration, to be resolved in China. In order to differentiate the group’s business activities from their financing activities, for the purposes of financing, some corporate groups may establish a special-purpose vehicle (“SPV”) on international markets. The SPV acts as the issuer, the parent company provides a joint liability guarantee for its bond issuance and the proceeds are for the group’s business operations. These issuers may wish to adopt the same guarantee structure when issue Panda Bonds in China. While the Interbank Panda Bond Measures do not specify the option for the above-mentioned guarantee structure, we understand that under certain circumstances, such guarantee structure could possibly be adopted for a bond issue. Since in this structure, the issuer is solely reliant upon the guarantor’s credit to issue bonds, any requirements showing the issuer’s qualifications, their application documents and information disclosure will be equally applicable to the guarantor. In addition, the proceeds raised by non-financial institutions should not be used as loans to other entities. Under the guarantee structure, proceeds are not normally used by the issuer itself or by its consolidated subsidiaries. Instead, the proceeds are used by the guarantor (generally the parent of the issuer) or the guarantor’s consolidated subsidiaries (i.e. the sister companies of the issuer). There is a need for further clarification from the governing authorities as to what will be the requirements for proceeds loaned to the parent or sister companies. Pursuant to the Notice on Stock Exchange Panda Bonds, foreign governmental agencies, non-financial corporations and financial institutions may apply to the Stock Exchanges to issue Panda Bonds. Currently, all issuers of Panda Bonds on the Stock Exchanges are offshore non-financial corporations. To date, no offshore financial institution has offered Panda Bonds on the Stock Exchanges, and there are no prevailing laws and regulations to prevent them from doing so. However, in practice, since financial institutions mainly issue bonds on the interbank bond market and the use of proceeds requires pre-approval from the PBOC, if an offshore financial institution plans to issue Panda Bonds on the Stock Exchanges, it should discuss in advance the feasibility of an issuance with the PBOC, the CSRC and the Stock Exchanges. Given that all issuers of Panda Bonds are registered offshore, there will likely be multiple law firms providing legal advice to the issuer. In those cases where the issuer’s place of registration and the place of listing are in different jurisdictions, there could be up to five or more law firms involved, including the issuer’s PRC legal counsel, their international legal counsel, the legal counsel from the issuer’s jurisdiction of incorporation (or internal legal counsel) (the “Local Legal Counsel”), the legal counsel in their place of listing and the underwriter’s PRC legal counsel. In order to manage the legal activities on Panda Bond issues, there would generally be two law firms involved, i.e., the issuer’s PRC legal counsel and their Local legal counsel. Please refer to Appendix II of this article for more details on the responsibilities and division of work among the relevant law firms. 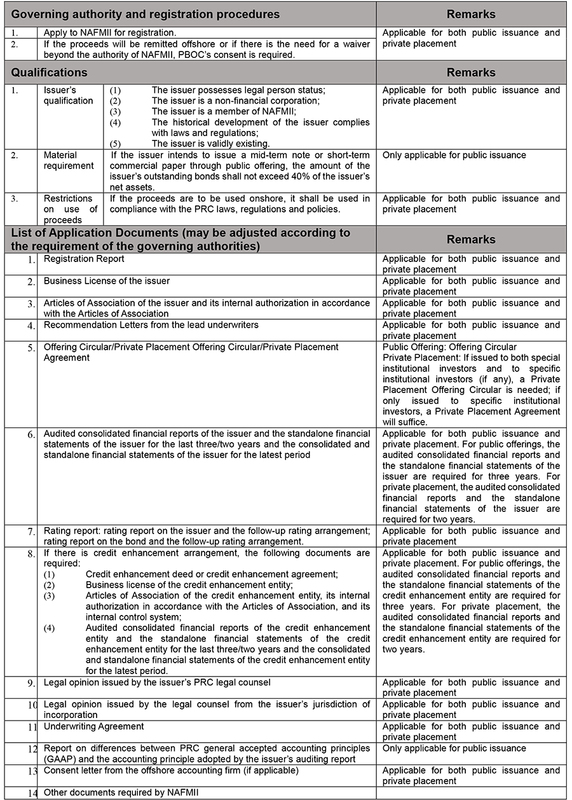 The following CSRC regulations apply to corporate bonds for all types of issues. The Shanghai Stock Exchange regulations are provided as an example here. 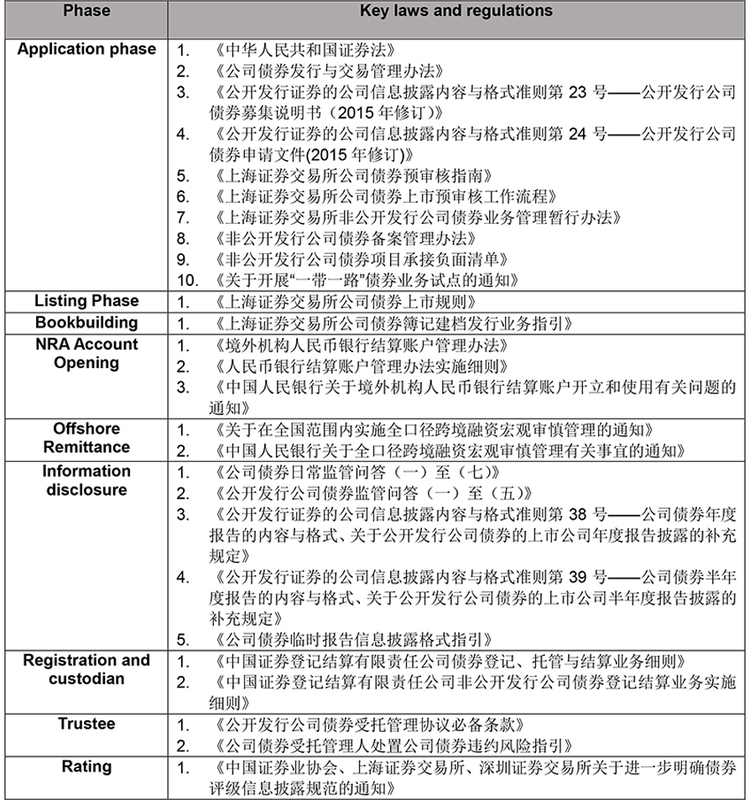 There are also relevant regulations for the Shenzhen Stock Exchange. 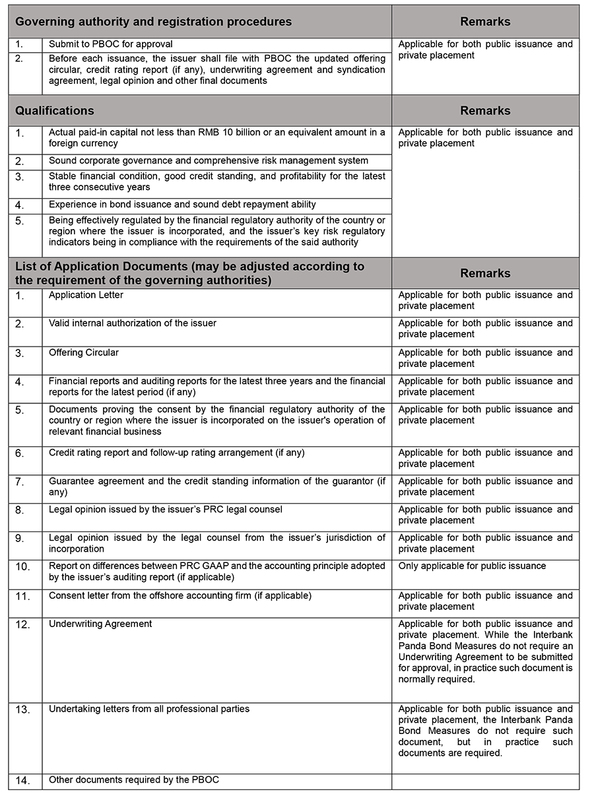 Under the assumption that the issuer would need both English and Chinese versions of the transaction documents, we have summarized the list of tasks and responsibilities, divided amongst the issuer’s PRC legal counsel, the issuer’s international legal counsel, the issuer’s Local Legal Counsel and Joint Lead Underwriter’s (JLU’s) PRC legal counsel based on the market practice. 1. In the scenario that the issuer is a foreign governmental agency or an international development institution, the issuer’s Local Legal Counsel work could be undertaken by the issuer’s internal legal counsel. 2. In practice, the issuer’s international legal counsel and their Local Legal Counsel may actually be branches of the same law firm, but with offices in different jurisdictions; where the international legal counsel is not engaged by the issuer, any work that is the responsibility of the issuer’s international legal counsel could be undertaken by the issuer’s PRC legal counsel. 3. Publicly-listed issuers will need to engage legal counsel from the jurisdictions of both its incorporation and listing place. 4. In practice, the JLU may not engage PRC legal counsel as their internal control department and the legal department of some JLUs may not require the JLU to engage PRC legal counsel.